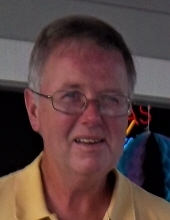 Danny Lee Moon, 67, of Danville, Va., passed away on Sunday, January 27, 2019, at Duke Raleigh Hospital, Raleigh, N.C. He was born on August 18, 1951, in Lynchburg, Va. to the late Mavis Brown Moon and the late Victor Moon. He is survived by his loving wife of 45 years, Marsha Hicks Moon. Mr. Moon graduated from George Washington H.S. and Elon College with a B.S. in Business Administration. He worked as General Manager for Commodore Corporation. Danny was one of the founding members of the Danville Harvest Jubilee Board in 1981, and remained on the Board since that time. He served as Board President for over 15 years. Mr. Moon was a member of Tuscarora Country Club for over 45 years. There he enjoyed playing golf, fishing and card games with the guys. Mr. Moon proudly served his country for six years in the Army National Guard. In addition to his wife, Mr. Moon is survived by his daughters, Sasha Michelle Moon Newcomb and husband, Jamie of Morrisville, N.C. and Sierra Nicole Moon Monkelien and husband, Michael of Gordonsville, Va.
Funeral services will be held at 2 p.m. Friday, February 1, 2019, at Norris Mt. Hermon Chapel with Rev. Fred J. Vicks officiating. The family will receive friends from 6 – 7:30 p.m. Thursday, January 31, 2019 at the funeral home, and at other times at the residence. The family respectfully requests memorial donations be made to God’s Pit Crew, 2499 N. Main Street, Danville, VA 24540 (www.godspitcrew.org). Norris Funeral Services, Inc. & Crematory, Mt. Hermon Chapel, 3995 Franklin Tpke., Danville, Va. is respectfully serving the Moon family. Online condolences may be made at www.norrisfuneral.com. To send flowers or a remembrance gift to the family of Danny Lee Moon, please visit our Tribute Store. "Email Address" would like to share the life celebration of Danny Lee Moon. Click on the "link" to go to share a favorite memory or leave a condolence message for the family.